Not Famous. Just Floral. Plus 40 fashion model, Bella Q, poses in a signature vintage rose print. No one recognizes me on the street, probably because I am in no way famous. When I was younger, I remember a number of people coming up to tell me that I was beautiful, and why wasn't I a model? I realized that it was meant to be a compliment- that question, "are you a model?" I remember saying I'd rather look like the rich women who could afford to buy the outfits, than to look like a model. It was a profession that never was tempting to me, personally. I'm not the typical fashion model material. I'm 5'6" and have crooked teeth, permanent dark circles under my eyes (there since childhood) and a few curves too many to make a perfect clothes horse. Trust me, when I started the Citizen Rosebud project, the last thing I wanted to do was pose in front of the camera, so it's funny that it turned out this way. Six years in, I am open to finding a few models to use, and am much more comfortable behind the lens than prancing about in front of it. But Mother/Necessity, etc, etc, being being what it is, when I couldn't find a willing victim to shoot, I had to step up. And stepped in front of the camera. It's an odd thing, taking your own photos. You see, I play both fashion model and fashion photographer. And I do my own editing- which, thanks to PicMonkey, I enjoy quite a bit. It's doubly strange to be your own model and photographer- major meta. Life loops in on itself, and perspective gets a bit, uh, weird. When the going get weird, the weird turn pro. Full time vintage seller makes me a part time fashion model. It is especially strange to see my own mug staring out at me over on the shop. W-I-E-R-D. So let me put this out there, if there's a Seattle soul who'd be interested in modeling for me, PLEASE CONTACT ME. I am open to that idea. Because cavorting in front of the camera, modeling vintage and pre-loved clothing is kind of a strange job. And I do it. There ya go- at the ripe old age of 48 and counting, I am a fashion model. But, ya know what? Strange as it may be, I'm enjoying the fact that this falls under my umbrella of life experience. What a gas. So if you're looking for some encouragement to get out of your own comfort level, and put yourself and your dreams front and center, I say DO IT! And, as "the"y say, we more often regret the things we didn't do, than regret the things we did. Linking up to the Style Crone for this month's Hat Attack! I say "do it!" too, and say yes first. I think you're a smashing model. Oh, and PicMonkey is the total boss. I love this outfit - it's so pretty, but still has an edge by adding the accessories. Those boots are fab! You look amazing! I actually hate modelling. It's awkward and uncomfortable for me. Your life in front of the camera has inspired me for years, Bella. Which includes your editing, of course. And your amazing creativity. 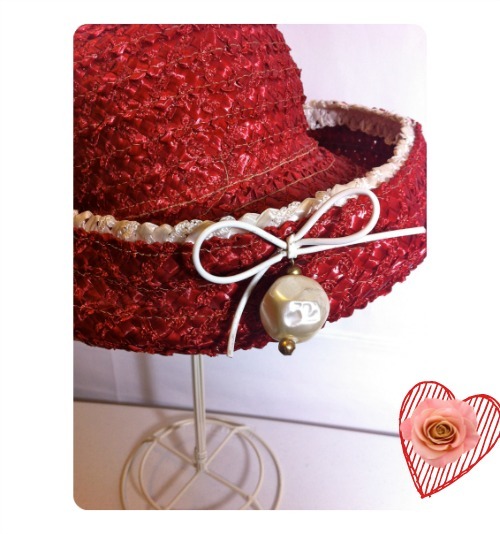 Thank you for sharing your gorgeous red hat with white trim with Hat Attack! Love this outfit Bella,esp the hat. I used to borrow a similar one from my Gramma back then. Love the outfit and that hat are such a cutie ! i also move your words ! 40 + woman are the hottets ! You're awesome Bella, love your poses, feminine and sweet :) And great dress!! dear lady, you're way more gorgeous than those teen girls used to show us some clothes!, because you've got the Attitude!, and you're damn beautiful! 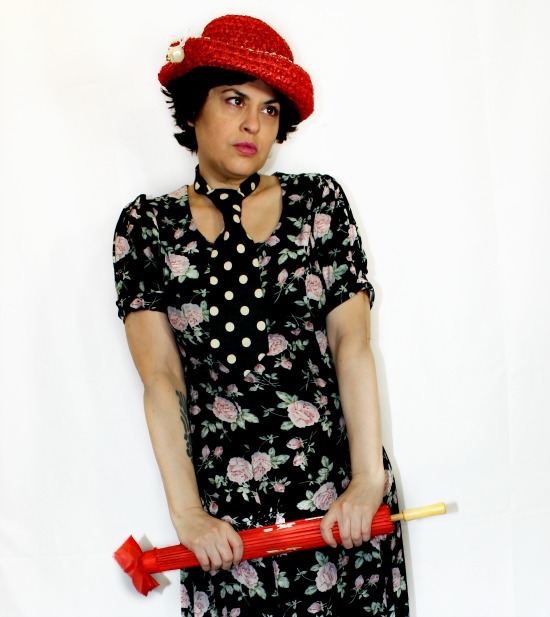 you look so cute wearing that floral dress and red umbrella!, and your little red hat!! What a fun outfit. Your personality and creativity always shine through in everything you do. Bella - you are a very striking woman, and I think you look wonderful in front of the camera! It is a weird thing for us "older women" when you think about it, this blogging thing, posting photos of yourself on the internet. I used to hate having my photo taken because of my very crooked teeth, and yet I've learned to "strike a pose" whenever someone asks if they can take my photo. I think all of the members of our 40+ blogging circle are so much more interesting to look at then any of the models on the runway. I'm with you on this one. I don't find it at all easy posing for someone and not for one minute do I ever think my photos have turned out well. But we are real women showing our real style so whats not to love? We all think you look fabulous hun. You're a standout model AND a great photographer! I love your outfit--especially the red hat and parasol. 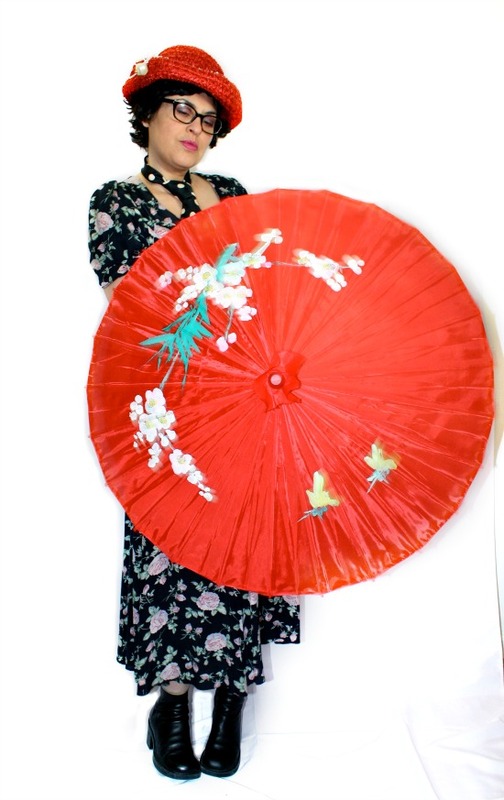 The open parasol pix is fabulous. Thanks for inspiring me. I am glad you found an outlet but... to say that Picmonkey is sufficient enough to be a model and even worse as a photographer is unbelievable. I have no idea why you would not spend he $10 a month and get Photoshop if you are serious about photography but it is all your choice, just don't get it myself.